The effects of the vitamin A metabolite retinoic acid (RA) are mediated at the transcriptional level by retinoic acid receptors (RAR). These proteins are part of a superfamily of transcription factors which activate target gene expression when bound to their respective ligands. In addition to ligand binding, heterodimerization with transcriptional cofactors and posttranslational modification such as phosphorylation are also critical for transactivation function. Previous studies have shown that phosphorylation of a serine residue at amino acid 77 in the RARα amino terminus was required for basal activation function of the transcription factor. We have determined that RA inhibits cyclin H and cdk7 expression thereby decreasing levels of phosphorylated RARα in human cancer cell lines. To determine the effects of decreased RARα phosphorylation in human cancer cells, we stably transfected a phosphorylation defective mutant RARα expression construct into SCC25 cultures. Cells expressing the mutant RARα proliferated more slowly than control clones. This decreased proliferation was associated with increased cyclin dependent kinase inhibitor expression and decreased S phase entry. In the absence of ligand, the RARα mutant inhibited AP-1 activity to an extent similar to that of RA treated control clones. Levels of some AP-1 proteins were inhibited due to decreased EGFR expression upstream in the signaling pathway. These results indicate that hypophosphorylated RARα can mimic the anti-AP-1 effects of RA in the absence of ligand. The effects of the vitamin A metabolite retinoic acid (RA) are mediated by two classes of ligand dependent transcription factors, the retinoic acid receptors (RAR) and the retinoid X receptors (RXR) . The RARs are activated by all trans RA and 9-cis RA whereas the RXRs are activated by 9-cis RA only. There are three known members of each class (termed α, β, and γ) encoded by separate genes. Each gene may express several different isoforms because of alternative splicing and differential promoter usage . Both the RARs and RXRs contain functional domains for DNA and ligand binding, dimerization with other transcription factors, and transactivation of RA responsive promoters. RARs and RXRs function as heterodimers that bind to response elements in the promoters of target genes to regulate RA dependent transcription. RAR/RXR binding to nuclear receptor corepressors such as NCoR and SMRT in the absence of ligand inhibits activation of RA responsive genes [3, 4]. Ligand binding displaces the repressors and recruits coactivator proteins such as CBP which have histone acetyltransferase activity . Histone acetylation allows for chromatin unwinding and transcriptional initiation of target gene expression . Previous studies have demonstrated that posttranslational modifications of RARs and RXRs are critical to the biological activity of the receptors. In the RARα amino terminus, a consensus mitogen activated protein kinase (MAPK) phosphorylation sequence was found to be a target of cyclin H and cdk7 . RARα was shown to bind the cyclin H/cdk7 complex in vitro and phosphorylation of serine 77 enhanced the transactivation function of RARα. This phosphorylation was required for the RA mediated differentiation of F9 cells into parietal endoderm . These studies point to the importance of phosphorylation in the proper functioning of RARs. Mutation of serine 77 to alanine in RARα has been shown to inhibit the basal activation function of the receptor . Other mutations have also been shown to decrease RAR function. RAC65 cells, an RA resistant clone of the pluripotent P19 embryonal carcinoma line, express a truncated RARα that lacks part of the ligand binding domain . As a result of this mutation, RAC65 cells do not differentiate when exposed to RA. An RARα clone truncated after amino acid 403 was effective in repressing reporter gene activity and blocking wild type RAR function [10, 11]. A single amino acid change in RARα (G303E) impaired RA binding affinity and significantly reduced reporter gene activity from responsive promoters. These studies illustrate the usefulness of dominant negative RAR mutants in elucidating mechanisms of RA signaling. In the present study we show that RA, by inhibiting cyclin H and cdk7 expression, reduces phosphorylation of RARα. We examined the role of hypophosphorylated RARα by mutating the cdk7 phosphorylation site in the receptor amino terminus (S77A). The S77A RARα mutant decreased proliferation of human cancer cells consistent with inhibition of the G1/S phase transition. Decreased proliferation of the mutant clones was associated with inhibition of EGFR mediated AP-1 expression and ERK1 activity, similar to the effects of RA. This study illustrates a novel mechanism by which RA inhibits proliferation (i.e., by decreasing RARα phosphorylation) and that in the absence of ligand, hypophosphorylated RARα can mimic the molecular and cellular changes associated with retinoid treatment. The mechanisms which regulate cyclin H/cdk7 phosphorylation of RARα have not been elucidated. To determine if RA itself could affect the phosphorylation status of its receptor, we treated SCC4 and SCC25 lines with 1 μM all trans RA for 16 hours. As shown in Fig. 1A, RA treatment decreased expression of both cyclin H and cdk7 in SCC4 and SCC25 cells by 3 fold. To determine if reduced cyclin H and cdk7 expression correlated with decreased RARα phosphorylation, we immunoprecipitated the receptor from vehicle and RA treated SCC4 and SCC25 cells. As shown in Fig. 1B, relative phosphorylation levels of RARα decreased by 3 fold, similar to the reduction in cyclin H and cdk7 expression. Previous studies have shown that the amino terminus of the estrogen receptor is phosphorylated by MAPK proteins . To determine the participation of MAPKs in RARα phosphorylation, we performed RARα immunoprecipitation on SCC25 cells treated with the MEK/ERK inhibitor PD98059 or p38 inhibitory drug SB203580. Treatment with these drugs did not change relative RARα phosphorylation levels (Fig. 1B). We concluded that RA repressed cyclin H/cdk7 expression which correlated with reduced RARα phosphorylation levels. RA decreases cyclin H-cdk7 expression and inhibits RARα phosphorylation. (A) SCC4 and SCC25 cells were treated with vehicle or 1 μM RA (+RA) for 16 hours as described in Methods. Cyclin H and cdk7 expression was determined by western blot. Blots were stripped and incubated with anti-β-actin antibody to ensure equal amounts of protein in each lane. (B) RA inhibits RARα phosphorylation. RARα was immunoprecipitated (IP RARα) from lysates of vehicle and RA treated SCC4 and SCC25 cells as described in Methods. Blots were incubated with anti-phosphoserine antibodies (anti-pSer) followed by stripping and probing with anti-RARα antibodies to ensure equal relative amounts of immunoprecipitated protein in each lane. To determine the specificity of this assay, SCC25 cells were treated with vehicle or the selective MAPK inhibitors PD98059 (50 μM) or SB203580 (10 μM) for up to 24 hours. RARα protein was immunoprecipitated as described above. These experiments were performed three times with similar results. Representative blots are shown. RA is a potent inhibitor of cellular proliferation . To determine the effects of hypophosphorylated RARα on the growth of human cancer cells, we expressed an S77A RARα expression construct in SCC25 cells. The serine residue at position 77 was previously shown to be the target of cyclin H/cdk7 phosphorylation . As shown in Fig. 2, expression of the S77A mutant resulted in decreased relative phosphorylation of immunoprecipitated RARα in stable clones compared to G418 resistant control cells. To confirm that this effect was due to expression of the hypophosphorylated RARα mutant, we also created stable clones expressing either HA tagged RARα or the S77A mutant. As shown in Fig. 3, only clones expressing HA-RARα and not the HA-S77A mutant showed phosphorylation on serine residues. These experiments indicate that the relative amount of phosphorylated RARα in SCC25 cells was decreased by the S77A mutant. SCC25 cells expressing the S77A mutant RARα proliferated at markedly reduced rates compared to control clones (Fig. 4). The S77A RARα mutants grew at only 30–50% of the rate of G418 resistant controls in culture. 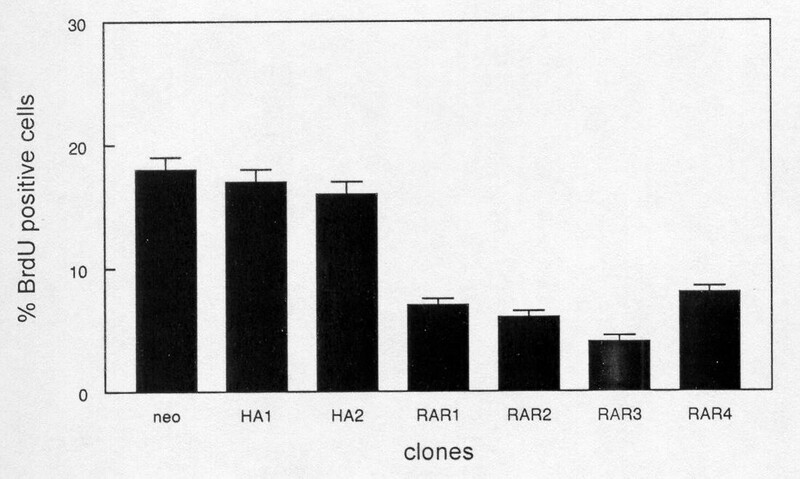 By comparison, proliferation of clones expressing HA tagged RARα was 90% of G418 resistant control cells. We concluded that decreased RARα phosphorylation produces inhibition of proliferation in SCC25 cells. The phosphorylation defective RARα mutant inhibits proliferation of human cancer cells. Expression of the S77A RARα mutant decreased endogenous RARα phosphorylation in SCC clones (RAR1-4) compared to G418 resistant control cells (neo). RARα protein was immunoprecipitated as described above. The S77A mutant is not phosphorylated on serine in SCC25 cells. Cells were stably transfected with HA tagged RARα (HA-RAR1,2), S77A mutant (HA-S77A1,2), or G418 resistance (neo) expression vectors. HA tagged RARα proteins were immunoprecipitated from cellular lysates using anti-HA antibody (IP HA). Blots were incubated with anti-phosphoserine antibodies (anti-pSer) to determine relative levels of RARα phosphorylation on serine residues. 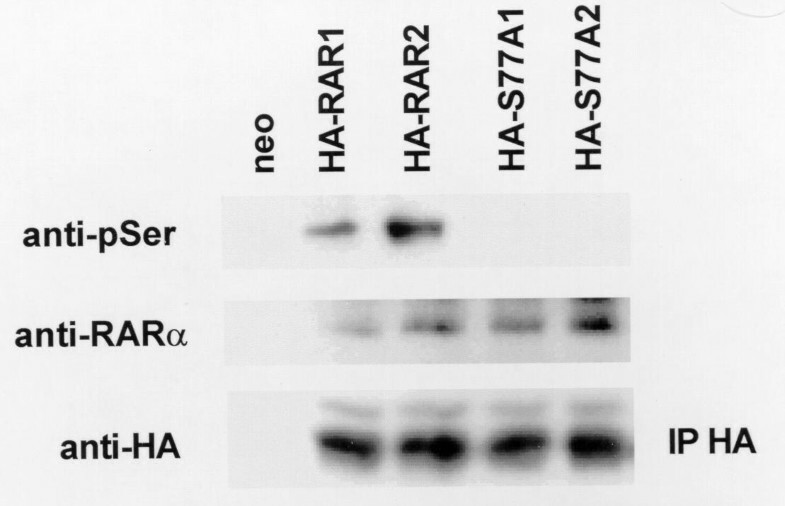 Blots were stripped and incubated with anti-RARα antibody to confirm the identity of the anti-HA immunoprecipitates. Blots were incubated with anti-HA antibody to ensure equal amounts of immunoprecipitated protein in each lane. These experiments were performed three times using different clones with similar results. Representative blots are shown. The S77A RARα mutant inhibits proliferation of SCC25 cells. 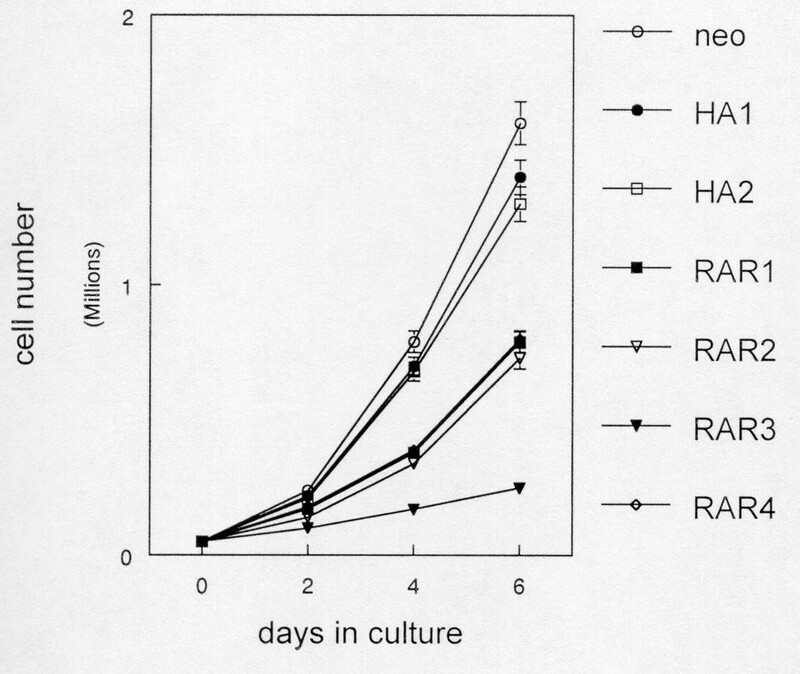 G418 resistant (neo), wild type HA-tagged RARα (HA1,2), and S77A mutant clones (RAR1-4) were cultured as described in Methods. At two day intervals, the cells in triplicate cultures were counted with a hemacytometer. These experiments were performed three times with similar results. Error bars indicate SEM. To determine if decreased proliferation of the mutant RARα clones correlated with inhibition of cell cycle progression, we performed BrdU incorporation analysis. As shown in Fig. 5, less than half the percentage of S77A mutant cells incorporated BrdU compared to the G418 resistant control clones. By comparison, there were no significant differences in BrdU incorporation between HA tagged RARα clones and G418 resistant control cells. These results indicate that the G1 to S phase transition of the cell cycle is inhibited in S77A mutant clones. To corroborate this conclusion, we examined expression of the G1 phase cyclin dependent kinase inhibitors p21WAF1/Cip1 and p27Kip1 in G418 resistant and S77A mutant clones. We also determined the expression of the S phase marker cyclin A in these cells. As shown in Fig. 6, expression of the G1 phase markers p21WAF1/Cip1 and p27Kip1 in the mutant RARα clones was up to 3 fold higher compared to control cells. In contrast, expression of the S phase marker cyclin A was decreased by 3 fold in two clones (RAR1 and 2) and was undetectable in 2 others (RAR3 and 4) when compared to G418 resistant control cells. These results indicate that the decreased proliferation observed in S77A RARα mutant clones is due to inhibition of cell cycle progression at the G1 to S phase transition. The phosphorylation defective RARα mutant inhibits G1 to S phase progression in human cancer cells. Decreased BrdU incorporation by carcinoma cells expressing the phosphorylation defective RARα mutant. Cultures of G418 resistant (neo), HA tagged RARα (HA1,2), and S77A RARα mutant (RAR1-4) SCC25 clones were subjected to BrdU incorporation analysis as described in Methods. The number of BrdU positive cells was expressed as a percentage of total cells counted in ten high power fields. These experiments were performed three times with similar results. Error bars indicate SEM. Cultures of G418 resistant (neo) and S77A RARα mutant (RAR1-4) SCC25 clones were harvested for western blot as described in Methods. Blots were incubated with primary antibodies to the G1 cyclin dependent kinase inhibitors p21WAF1/Cip1 and p27Kip1 and to the S phase cyclin A. These experiments were performed three times using different lysates with similar results. Representative blots are shown. The antiproliferative effects of RA have been attributed to its inhibition of AP-1 transcriptional activity . While the S77A RARα mutant has been shown to inhibit transactivation of RA response elements , its effects on AP-1 activity have not been characterized. We first addressed this issue by transiently transfecting a heterologous promoter containing a consensus AP-1 site fused to the luciferase reporter gene  along with wild type RARα or S77A mutant expression vectors. In the absence of ligand, the S77A RARα mutant inhibited AP-1 activity from this construct by 50%, similar to treatment with 1 μM all trans RA (Fig. 7). The wild type receptor possessed slight anti-AP-1 activity in the absence of ligand (20% reduction compared to control cells transfected with blank expression vector). These results indicate that hypophosphorylated RARα can mimic the effects of RA by inhibiting AP-1 activity. The phosphorylation defective RARα mutant inhibits AP-1 activity in the absence of RA. Triplicate cultures of SCC25 cells were transiently transfected with a heterologous promoter construct containing an AP-1 response element in the luciferase reporter vector pGL3 as described in Methods. Wild type (alpha) or S77A mutant RARα expression vectors were cotransfected with the reporter constructs. Blank expression vector was used to control for the amount of DNA transfected. Transfected cultures treated with vehicle or 1 μM RA for 24 hours were used as controls for AP-1 inhibition. Relative light units from vehicle treated cells transfected with reporter construct and blank vector were assigned an arbitrary AP-1 activity value of 100. These experiments were performed three times with similar results. Error bars indicate SEM. To determine if reductions in AP-1 protein levels could account for the observed transcriptional inhibition by the S77A mutant RARα, we compared expression of fos and jun proteins in G418 resistant control clones and S77A RARα expressing cells. As shown in Fig. 8, Fra-1 expression was undetectable in 3 of 4 RARα mutant clones. Expression of c-jun was reduced by 3 to 4 fold in the S77A RARα cells compared to G418 resistant control clones. 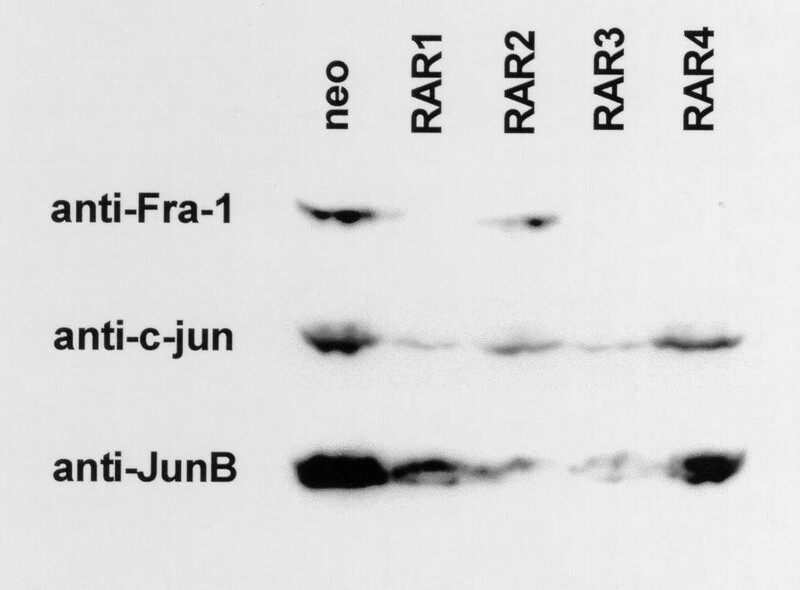 JunB expression was also decreased by up to 20 fold in mutant RARα expressing cells. Expression of c-fos, Fra-2, FosB, and JunD was not detected under normal growth conditions in SCC25 cells. These results indicate that decreased AP-1 protein expression correlates with AP-1 transcriptional inhibition by hypophosphorylated RARα. The phosphorylation defective RARα mutant inhibits EGFR expression, ERK1 activation, and AP-1 protein levels. (A) Cultures of G418 resistant (neo) and S77A RARα mutant (RAR1-4) SCC25 clones were harvested for western blot as described in Methods. Blots were incubated with anti-human primary antibodies to AP-1 proteins Fra-1, c-jun, or JunB. These experiments were performed three times using different lysates with similar results. Representative blots are shown. Upstream of AP-1 transcription factors, RA has been shown to inhibit epidermal growth factor receptor (EGFR) expression . To determine if hypophosphorylated RARα could inhibit EGFR expression, we examined expression of the growth factor receptor by western blot in control and S77A mutant cells. As shown in Fig. 9, EGFR expression was undetectable in 3 of 4 mutant RARα clones and was reduced by 50% in the remaining clone (RAR1). To determine if this dramatically decreased EGFR expression could inhibit downstream components of EGF signaling, we also examined activation of ERK1 (a terminal effector in the mitogen activated protein kinase pathway). Activated ERK1 in S77A mutant cells was expressed at less than 10% of the levels found in G418 resistant control clones. Overall ERK1 expression was not affected by hypophosphorylated RARα. These results indicate that components of the EGFR signaling pathway, upstream of AP-1 transcription factors, are inhibited by hypophosphorylated RARα. EGFR expression and ERK1 activation are inhibited in S77A RARα mutant cells. Cells were harvested for western blot as described above. 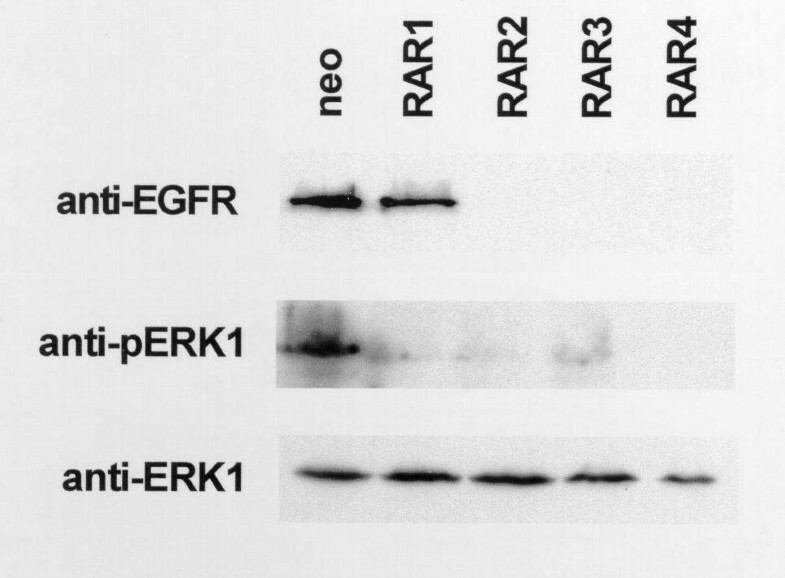 Blots were incubated with anti-human primary antibodies to EGFR, activated ERK1 (anti-pERK1), and total ERK1. These experiments were performed three times using different lysates with similar results. Representative blots are shown. Activation of growth factor receptors has been shown to induce expression of AP-1 proteins . To determine if EGF signaling correlated with AP-1 activity in SCC25 cells, we first incubated cultures in 1% depleted serum for 16 hours to inhibit AP-1 protein expression. We then stimulated these cultures with 10 ng/ml EGF for up to 4 hours. As shown in Fig. 10, EGF produced dramatic induction of AP-1 protein expression within 15 minutes after its addition. c-fos expression peaked at 100 fold over unstimulated levels at 2 hours following EGF addition. Following a similar time course, c-jun expression increased by 25 fold following stimulation by EGF. Induction of Fra-1 and JunB expression was also noted, although the increase was of less magnitude than that observed for c-fos and c-jun. The effects of EGF on AP-1 protein expression were completely blocked by the EGFR kinase inhibitor tyrphostin AG1478 (data not shown), indicating that growth factor receptor signaling directly correlates with AP-1 protein expression. These data suggest that in the unliganded state, hypophosphorylated RARα can mimic the effects of RA on EGFR expression, ERK1 activity, and AP-1 protein levels. EGFR activation induces AP-1 protein expression in human cancer cells. SCC25 cells were cultured in low serum medium prior to stimulation with 10 ng/ml EGF for up to 4 hours as described in Methods. 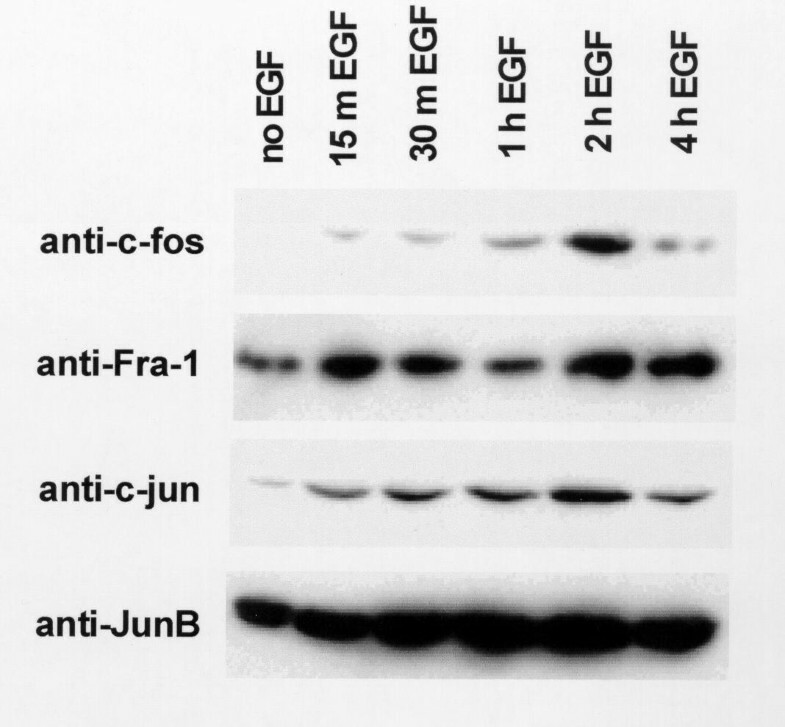 Whole cell lysates were subjected to western blot analysis using anti-human primary antibodies to c-fos, Fra-1, c-jun, and JunB. These experiments were performed three times using different lysates with similar results. Representative blots are shown. The antiproliferative effects of RA have been recognized for many years. This important chemotherapeutic property of RA has been attributed to a number of molecular mechanisms. Decreased growth factor and growth factor receptor expression has been proposed as a potential growth inhibitory mechanism . Additionally, RA mediated inhibition of AP-1 activity is believed to be important in cellular growth control by this ligand . AP-1 inhibition via direct interaction between RARs and AP-1 proteins has been proposed . RA inhibition of jun N-terminal kinase was shown to prevent c-jun phosphorylation, resulting in decreased AP-1 activity . Competition between RAR and AP-1 for limiting amounts of the nuclear receptor coactivator CBP may also account for decreases in AP-1 transcriptional activity . In the present study we have described a new mechanism by which RA can inhibit cellular proliferation. RA inhibited cyclin H and cdk7 expression which correlated with hypophosphorylation of RARα on serine 77. To separate the specific role of hypophosphorylated RARα from the pleiotropic effects of the ligand, we expressed a non-phosphorylatable S77A mutant protein in human cancer cells. The S77A RARα mutant inhibited proliferation of SCC25 cells even in the absence of RA, thereby mimicking the growth inhibitory effect of the ligand. This growth inhibition correlated with a delay in G1 to S phase progression. EGFR expression, ERK1 activation, and AP-1 activity were inhibited by the mutant RAR, effects which are also achieved by RA treatment alone. We determined that decreases in AP-1 protein expression observed in the RARα mutant clones were primarily due to diminished EGFR signaling. Therefore while ligand bound RARα has been shown to activate a large number of RA target genes, the hypophosphorylated form of the receptor created in some cells following retinoid treatment may be important in transcriptional repression. In support of this hypothesis, Rochette-Egly et al. described decreased transactivation function by the S77A mutant RARα. Previously we characterized another RARα mutant in which the receptor protein was truncated after amino acid 403, thereby deleting the AF-2 domain . This truncated receptor exhibited similar properties to the S77A mutant (growth inhibition and repression of RA responsive gene expression including EGFR). Repression of RA responsive gene expression was believed due to the inability of this RAR to interact with CBP via its shortened carboxyl terminus . By the same token this mutant receptor did not affect RA inhibition of AP-1 activity, presumably due to its inability to compete for CBP . We observed decreased AP-1 activity in transient transfections using the RAR403 mutant likely due to decreased EGFR expression. 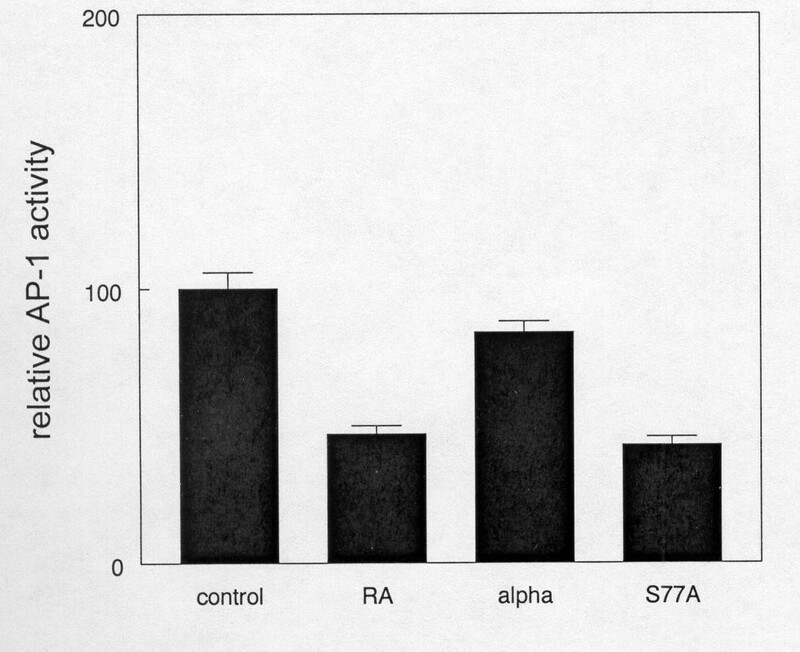 However, the mechanisms by which the S77A mutant inhibits RA responsive gene expression is unknown. The RARα amino terminus is not known to interact with CBP or its associated factor PCAF [5, 18]. Additionally, RARs bind to the interaction domains of repressor proteins such as NCoR via region D of the receptor rather than the amino terminus . Despite the lack of obvious interaction of the RAR amino terminus with nuclear receptor cofactors, the S77A mutation may alter the three dimensional structure of the receptor. This altered configuration may prevent the mutant receptor from releasing repressor proteins or recruiting coactivators in the presence of ligand. The S77A mutant receptor was shown to inhibit ligand dependent transactivation of RA responsive promoters , but the mechanism of this reduction (e.g., competition for binding sites, cofactor interaction, ligand binding) has not been determined. In summary, decreased RARα phosphorylation correlating with RA mediated inhibition of cyclin H and cdk7 expression illustrates a new mechanism by which ligand can indirectly regulate receptor activation. This raises the question of how RA initially downregulates cyclin H and cdk7 expression, whether by AP-1 inhibition or through negative retinoid response elements in the regulatory regions of the genes. The characterization of potentially altered interactions between hypophosphorylated RARα and its cofactors will provide unique insight into how post-translational modification of nuclear hormone receptors regulates repressor release, coactivator recruitment, histone acetylation, and transcriptional activation. The human squamous cell carcinoma lines used in this study were purchased from the American Type Culture Collection and have been described previously . Cells were cultured in Dulbecco's modified Eagle medium (DMEM), 10% fetal bovine serum (FBS), and 40 μg/ml gentamicin at 37°C in a humidified atmosphere of 5% CO2. S77A mutant or wild type RARα cDNAs were cloned into the pCruz-HA expression vector. These vectors or blank plasmid were transfected into SCC25 cells using Lipofectamine reagent according to manufacturer's recommendations (Invitrogen). Cells were selected in 400 μg/ml G418 for 14 days. Resistant clones were picked for expansion and characterization. SCC4 and SCC25 cells were treated with 1 μM all trans RA for 16 hours. In a separate set of experiments, SCC25 cells were cultured for 16 hours in DMEM, 1% charcoal-resin treated FBS followed by stimulation with 10 ng/ml epidermal growth factor (EGF) for up to 4 hours. 75 μg total cellular protein was separated by SDS-PAGE on 10% resolving gels under denaturing and reducing conditions. Protein lysates from G418 resistant and S77A mutant RARα clones were also analyzed. Separated proteins were electroblotted to PVDF membranes according to manufacturer's recommendations (Roche Molecular Biochemicals). Blots were incubated with antibodies to human cyclin H, cdk7, cyclin A, p21WAF1/Cip1, p27Kip1, EGFR, activated and total ERK1, c-fos, Fra-1, c-jun, JunB, or β-actin (Santa Cruz Biotechnology) for 16 hours at 4°C. After washing in Tris buffered saline containing 0.1% Tween 20 (TBST, pH 7.4), blots were incubated for 30 minutes at room temperature with anti-IgG secondary antibody conjugated to horseradish peroxidase. Following extensive washing in TBST, bands were visualized by the enhanced chemiluminescence method (Roche Molecular Biochemicals) and quantitated by laser densitometry. SCC4 and SCC25 cells were treated with 1 μM all trans RA for 16 hours. To determine if ERK1 or p38 MAPKs phosphorylated RARα, some cultures were treated with 50 μM PD98059 or 10 μM SB203580 for the same time period. Cultures of G418 resistant and S77A RARα mutant clones were used in separate immunoprecipitation experiments. Cultures were lysed in 50 mM HEPES (pH 7.5), 150 mM NaCl, 1 mM EDTA, 2.5 mM EGTA, 1 mM DTT, 1% Nonidet P-40, 10% glycerol, 1 mM NaF, 0.1 mM sodium orthovanadate, and protease inhibitors for 30 minutes at 4°C. Lysates were centrifuged at 10,000 × g for 10 minutes and anti-RARα or anti-HA antibodies (Santa Cruz Biotechnology) were incubated with the supernatants for 1 hour at 4°C. Antigen-antibody complexes are precipitated with protein A/G agarose beads for 1 hour at 4°C. Immunoprecipitated proteins were washed three times with 1 ml lysis buffer. Samples were boiled in 1× Laemmli buffer for 3 minutes, separated by SDS-PAGE, and blotted to polyvinylidene difluoride membranes. 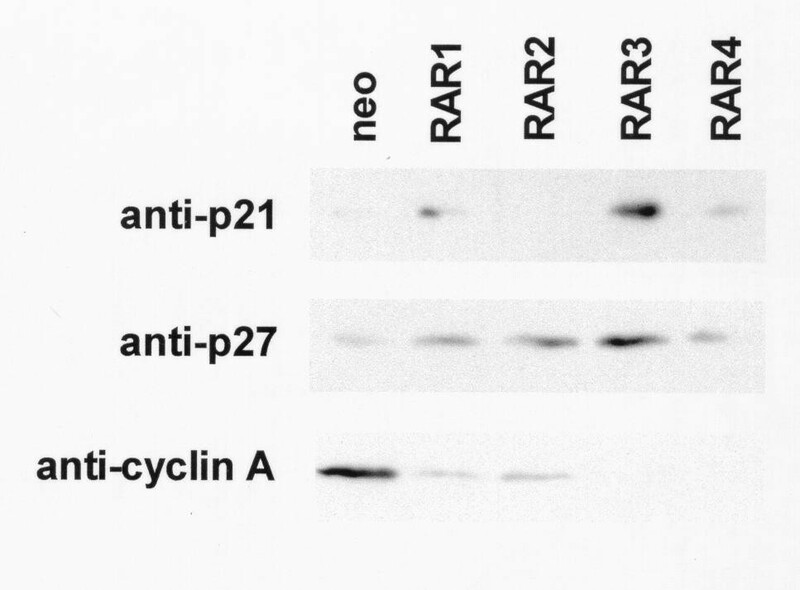 Blots were probed with anti-phosphoserine antibody (Zymed) to determine relative phosphorylation levels of immunoprecipitated RARα. Blots were then stripped and incubated with anti-RARα antibodies to ensure equal amounts of immunoprecipitated protein in each lane. Bands were visualized by the enhanced chemiluminescence method and quantitated by laser densitometry. 5 × 104 G418 resistant SCC25 control cells, RARα overexpressing cells, or S77A mutant RARα clones were plated in triplicate into 6 well tissue culture plates and grown for 6 days. At two day intervals, cells were trypsinized and counted with a hemacytomter. SCC25 control, RARα overexpressing, and S77A RARα mutant clones were cultured on plastic then incubated with 10 μM BrdU for 1 hour. After washing in PBS, cells were fixed in 70% ethanol, 50 mM glycine (pH 2) for 30 minutes at -20°C. Following extensive washing in PBS, cells were incubated with mouse anti-BrdU primary antibody at 37°C for 30 minutes. After washing in PBS, cells were incubated with anti-mouse IgG secondary antibody conjugated to fluorescein at 37°C for 30 minutes. Following extensive washing in PBS, BrdU positive cells were visualized by fluorescence microscopy. The number of positive cells was expressed as a percentage of total cells counted in ten randomly selected high power fields. Triplicate dishes of SCC25 cells were transiently transfected with 5 μg luciferase reporter construct containing a heterologous promoter containing a consensus AP-1 site 5'-TGACTCA-3' . 2 μg of wild type or S77A mutant RARα expression vector was cotransfected to determine the effects of RARα phosphorylation on AP-1 promoter activity. 1 μg of a β-galactosidase expression vector was also included to normalize for transfection efficiency. Some cultures were treated with 1 μM all trans RA or 0.1% ethanol vehicle for 24 hours. Reporter assays were performed using the Dual-light kit according to manufacturer's recommendations (Tropix). Luciferase activity was normalized to that of β-galactosidase for each sample. We thank Dr. Matt Lee and Susan Smith for assistance with site directed mutagenesis. This study was supported by National Institutes of Health grant DE10966 to DLC. DLC conceived the study and participated in its design and execution. RK performed all studies related to the effects of RA on RAR phosphorylation by cyclin H/cdk7. Both authors read and approved the final manuscript.